Utilizing funding provided though an agreement with the USDA-Natural Resources Conservation Service as well as donations made by Farm Credit Services of America, First Dakota National Bank, Ducks Unlimited Inc., and Dacotah Bank the SD Soil Health Coalition provides educational “Soil Health Buckets” and lessons to vocational agriculture classrooms, soil science classrooms and additional youth groups. 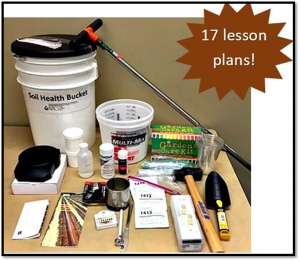 Each “Bucket” includes seventeen different lesson plans and the tools necessary to demonstrate the soil health principles and concepts included within the plans. Each bucket complete with all necessary items has a price tag of nearly $500. The SD Soil Health Coalition would like to thank the current contributors, and will continue to work to provide each classroom the bucket, lesson plans, and follow up to educate our youth about soil health! Those interested in receiving a Soil Health Bucket or contributing towards this project should contact Cindy Zenk, SDSHC Coordinator, at (605) 280-4190 for additional information.